This books aims to introduce the reader to the first promising approach for attacking complexity’s very nature, by understanding complexity itself so that it can be split into smaller parts, which can be individually tackled. Solving the Dynamic Complexity Dilemma examines the growing business problem of dynamic complexity and presents a path to a practical solution. To achieve better predictability, organizations must be able to expose new, dangerous patterns of behavior in time to take corrective actions and know which actions will yield the optimal results. This book promotes new methods of risk management that use data collection, analytics, machine learning and automation processes to help organizations more accurately predict the future and take strategic actions to improve performance outcomes. The presented means of achieving this goal are based upon the authors’ practical experiences, backed by scientific principles, and results achieved through consulting engagements with over 350 global organizations. Dynamic complexity results from hidden, un­known factors—or more precisely, interactions between factors—that can unexpectedly im­pact the perfor­mance of systems. When the influences of dynamic complexity are not meas­ured and understood, new never-seen-before behaviors can come as unwelcomed surprises, which disrupt the performance of systems. Left alone, processes that were once prized for their effi­ciency unexpectedly begin to degrade—costs increase, while volumes and quality decline. Evidence of problems may come too late for effective resolution as technology advance­ments induce rapid change and compress the time available to react to that change. The results of dynamic complexity are always negative and unmanaged dynamic complexity can bring business or global systems to the point of sudden chaos. The 2009 H1N1 pandemic, 2008 Credit Crunch and 2011 Fukushima Daiichi nuclear disaster are global examples of the dangers of undiagnosed dynamic complexity. With increasing frequency executive leaders today are discovering that their business and IT system performance levels are not meeting expectations. In most cases these performance deficiencies are caused by dynamic complexity, which lies hidden like a cancer until the symptoms reveal themselves—often when it is too late to avoid negative impacts on business outcomes. 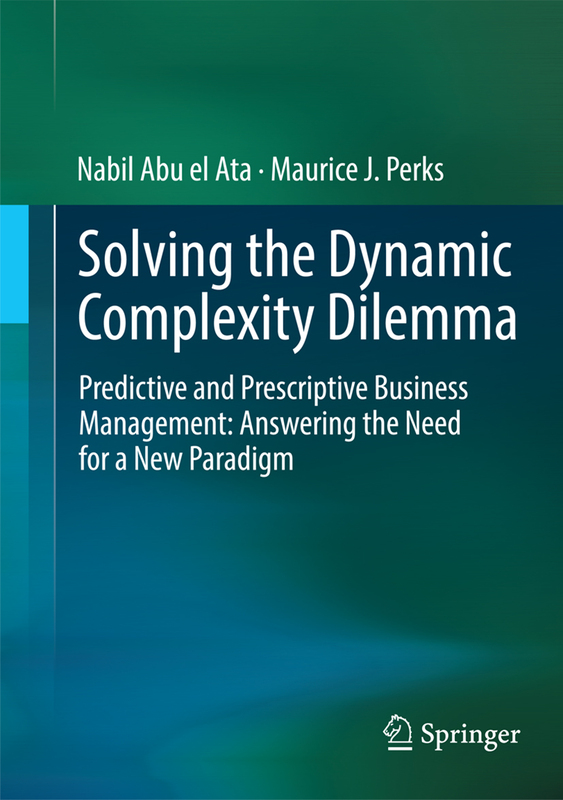 This book examines the growing business problem of dynamic complexity and presents a path to a practical solution. To achieve better predictability, organizations must be able to expose new, dangerous patterns of behavior in time to take corrective actions and know which actions will yield the optimal results. The book authors promote new methods of risk management that use data collection, analytics, machine learning and automation processes to help organizations more accurately predict the future and take strategic actions to improve performance outcomes. The presented means of achieving this goal are based upon the authors’ practical experiences, backed by scientific principles, and results achieved through consulting engagements with over 350 global organizations. Dr. Nabil Abu el Ata, Founder and CEO, Accretive Technologies as Accretive’s founder and CEO, Dr. Abu el Ata has invested over 20 years in perfecting the science behind the company’s X-Act Platform with over 15 patents. He offers a breadth of analytical skills, risk management and business intelligence expertise, as well as IT and business process management knowledge. To say Dr. Abu el Ata has a passion for mathematics, science and technology and more specifically modeling of dynamic complexity for corporate systems would be under­statement. Having published two books, 15 scientific papers, and over 300 tech­nical and management reports, he has a proven ability to absorb, process and add insight on a wide variety of technological subjects. Dr. Abu el Ata’s accomplishments include doctorate (Ph.D. and D.Sc. from Paris-Sorbonne) and bachelor’s degrees in Mathematics and a master’s degree in Physi­cal Sciences (Royal Observatory, Cambridge University). He is a valued former Doctorate Fellow of the European Space Organization; former Data Processing Director and Advisor for the French Atomic Energy Authority; and former CTO of First Data. Dr. Abu el Ata is also an advisory board member of the European Strategic Program for Research in IT; a Steering Committee member for European Programs: Pyramid, Europicon and Itaqua; an advisor to CLS, Deutsche Bank, First Data and BNPP and an advisory board member of French Employment Organization, French Ministry of Finance, French Postal Services, one of France’s largest banks (Credit Agricole); an External Professor for a number of universities in France, the UK, and the US; and Laureate of ComputerWorld Honors 2008. Dr. Maurice J. Perks, Board Technology Adviser Accretive Technologies Dr. Perks joined IBM in 1968 as a Systems Engineer. Over the span of his 44-year career with IBM, Dr. Perks specialized in the design of IT systems for large organizations. He is a world authority on the development of IT sys­tems in a range of industry sectors, and particularly the financial sector. Dr. Perks is noted for his methodological approach, which helps to understand and assess the complex­ity of systems, and his ability to apply that knowledge to design and modify complex sys­tems. He is currently working to promote under­standing of modern IT systems complexity and is bringing new ways of combining the triangle of business knowledge, IT knowledge and mathematics to this challenge. He is constantly seeking new ways of avoiding the increasing complexity that IT sys­tems are externalizing to business change. He is a great believer in the increased use of modeling and simulation to help tame the growing challenges that business and IT change pose. His ability to understand real-world business and IT system design was recognised by IBM in 2002, when Dr. Perks became the first IBM Fellow to be appointed from within the IBM Services Division. As a Fellow of the British Computer Society, a Fellow of the Institute of Engineering and Tech­nology and a Royal Academy of Engineer­ing Visiting Professor of IT Integration at the University of York, Dr. Perks offers a wealth of knowledge and real world experience as Accretive’s Board of Director, Technology Advisor. The Aston University, UK has recognized his sustained work on complex system design. The Tyranny of Uncertainty: A New Framework to Predict, Remediate and Monitor Risk is now available in print and e-book at online book sellers including Amazon.com and Springer. ©2019 URM GROUP. All rights reserved.